Hanoz H.R. Patel is a Vadodara-based historian and museologist. The Rabari community is a nomadic pastoral community indigenous to north-west India, particularly modern-day Gujarat. Traditionally, the Rabari kept camels but in recent times they maintain flocks of sheep and goats as well. Tradition traces their origins to the Himalayas, as the creation of Shiva and Parvati. The Rabari community cherishes its customs, mythology, history and ancestral heritage, which are intimately entwined with their traditional occupation of animal keeping. The Rabaris form a very close-knit community, which only in recent decades has started to show signs of adapting to modern times. However, constitutional protection eludes the Rabari, or at best is ill-defined, owing to their nomadic lifestyle and the lack of governmental understanding. The story of their arrival in Kutch (also Kachchh), Gujarat, is a story of momentous migration from the Himalayas to Punjab, Haryana, Mathura, Rajasthan and, finally, into Kutch via Pakistan. The community is known by different names in different states, like Rabari in Gujarat, Raika in Rajasthan, Pal in Punjab, among others. The Rabaris are further divided into sub-groups based on geographical location, which are known as parganas. Three major sub-groups residing in Kutch are the Dhebarias, Vagadias and Kachhis. Among these, the Dhebarias are credited with having engaged in national-scale migration in relation to their animal-keeping occupation. For the purpose of this module, information was collected from the Dhebarias residing in the various villages around Anjar taluka in the Kutch district of Gujarat. The Rabari community traces its origin to the Himalayas, where, they believe, Shiva and Parvati created them. The story narrates that Shiva and Parvati, who were residing on Mount Kailash near Mansarovar Lake in the Himalayas, were engaged in a long discussion on various subjects, one of which was their loneliness in this universe. Parvati especially experienced boredom since she did not have anybody around to play with. She shared her feelings with Shiva, who then suggested they create a living being. When Parvati asked Shiva how she should pursue this creation, Shiva advised her to take some dirt from her own body and shape it into any figure and he would infuse life into it. Accordingly, Parvati shaped the dirt from her body to fashion a five-legged camel, which Shiva gave life. They then created the first Rabari man, who they named Sambad, to tame and graze the camel. Sambad would take the five-legged camel to graze everyday in the jungles around Kailash. But Sambad faced a lot of difficulties while grazing this peculiar camel, which could not walk properly in the dense forests due to its five legs. A harassed Sambad one day visited Shiva and Parvati to seek a remedy for this daily troubles. He narrated the troubles he faced and pleaded with them to solve his dilemma. In compassion, Shiva decided to help his child. He pushed the central leg of the camel upwards, thus creating the hump on the back of the animal. Shiva then asked Sambad to go graze the animals, drink its milk and live free. And so this led to the creation of the first Rabari who started rearing animals as his primary occupation. In subsequent years, Parvati kept worrying about the prospects of marriage of her child, Sambad. She was especially worried since there were no women to whom she could marry Sambad. She decided to discuss her worries with Shiv. In those times, several apsaras (celestial nymphs) from the heavens would come down to Earth to bathe in the Manasarovar Lake every morning. They asked Sambad to go to the Manasarovar Lake in the morning and while the apsaras were bathing, to steal their clothes and run away. Accordingly, Sambad stole the clothes of the apsaras and came to Shiv and Parvati. The apsaras pursued Sambad and arrived at Kailash. They presented their complaints before Shiva and Parvati, stating that their son, Sambad, had attacked their modesty and honour. To resolve the matter, Parvati decreed that Sambad would return their clothes and in return one of the apsaras would marry him, to which the apsaras agreed. Parvati suggested Sambad ask for the hand of the Apsara named ‘Rai’, who was the darkest and least beautiful apsara among them all. And so Sambad Rabari got married. Sambad and Rai’s progeny came to be known as ‘Raika’ in Rajasthan and Rabari in Kutch, Gujarat. Their lineage grew and spread into several branches, which the community knows as shaakh (branches) or atak (surname). There are a total of 133 shaakhs or ataks in the Rabari community, which are recognised collectively as vihotter. The decomposition of vihotter is ‘vi’ meaning 20, ‘ho’ meaning 100 and ‘ter’ meaning 13, which adds up to 133. The lineage of Sambad and Rai continued their father’s occupation of animal keeping, and prospered. In the initial years, Shiva and Parvati gifted the lineage of Sambad and Rai with camels for their occupation of animal-keeping. However, as the numbers grew the lineage of Sambad decided to migrate out of Kailash. Shiva and Parvati gave their blessings and bestowed on them vast riches and gifts. The initial migration of the Rabari’s brought them to Haryana and Punjab. Some of the Rabari clans settled in these areas while most decided to continue their migration. The migratory clans continued their southern movement till they arrived in Mathura, which at the time was ruled by Lord Krishna. These clans found the life around Mathura very conducive for animal keeping and an apt place to settle. When Lord Krishna decided to migrate from Mathura towards Dwarka in the Gujjar Pradesh (Gujarat) to resettle his Yadava clan, the Rabari community followed his lead and migrated towards western India and arrived in various parts of Gujarat (Saurashtra, Kathiawar) and Rajasthan. A majority of the Rabari community members settled in areas around Jaisalmer in Rajasthan as well, which at the time was under the rule of a Muslim ruler. It is said that this ruler fell in love with a Rabari girl and approached the community to hand the girl over to him. The Rabaris felt betrayed by this inappropriate demand, and despite all their diplomatic efforts, failed to convince their ruler, who instead threatened to take her away forcefully. The Rabaris requested a period of grace to think and come to a decision. The ruler agreed to grant them time to think, but, in return, ordered the imprisonment of most of the prominent leaders of the Rabari community. He promised to free them once the Rabaris were ready with their decision. The Rabaris understood that this was a plot from which they would not be able to break free by any means. Their leaders, before being imprisoned, assured their brethren to escape from Jaisalmer instead of giving in to the inappropriate demands of a Muslim ruler. The Rabari community spread the message across their community, that in order to save the modesty and honour of a daughter of the community they would escape this kingdom during the night. In the darkness of the night, the entire Rabari community escaped the kingdom of Jaisalmer and migrated to Kutch, which was then being ruled by a benevolent ruler, who welcomed them with the promise of shelter and freedom of movement. Kutch, during those times, was very fertile and possessed vast quantities of vegetation, and so it was here that the Rabaris finally settled. The Rabari community, to remind themselves of this shameful escape, gave up wearing colourful clothes: the men started wearing white while the women started wearing black. Another version of this decision states the community decided to wear white and black, which were worn only during days of mourning, to commemorate the ignominy of their escape. Mindiyala, a small village in the Anjar taluka of the Kutch district, Gujarat, is home to the majority of the Rabari community, and is considered the biggest Rabari village in India. According to oral tradition, the land on which the village presently stands was once a vast expanse of forests. As the area was very conducive for animal grazing, several dangs (groups) of the Rabari community migrated here. The only deficiency of the area was its lack of water. The Rabari who led the migrating dangs here was called Harpal. The lack of water was a constant cause of dispute in the family of Harpal, especially among the women of the dang. Once while Harpal and his dang had migrated into the Sindh province for grazing, he decided to undertake penance before the Dargah of Pathaji Pir, stories of whose miracles he had heard. Harpal prayed and fasted and finally fell asleep in exhaustion. Pathaji Pir appeared in his dreams and asked him the purpose of his penance. Harpal shared his troubles and requested him to grant him the boon of water where his dang was camped. Pathaji Pir asked him to return to his dang and dig a well on the western side of his camp. As proof that the water from the well is the boon from him, Pathaji Pir gave Harpal signs to look out for. The first sign was that water in the well would come from the north, the second sign would be that a fish would appear in the fresh water that would have a Sindhi rice grain in its mouth, while the third and final sign would be that a plant called mindi would grow in the well. Pathaji Pir asked Harpal to name the village he would establish there, ‘Mindiyala’, after the plant that would grow in the well. And so, Harpal followed each direction to the letter, and each event occurred as foretold by Pathaji Pir. In subsequent years, the village of Mindiyala prospered and flourished, and the villagers, till date consider Harpal as the greatest of their ancestors. The villagers erected a dargah on top of the hill near Mindiyala in memory of the blessings of Pathaji Pir. The villagers of Mindiyala share a common belief that the water from this well will never diminish, no racial discrimination will be entertained near this well and no living being will die if it falls in the well. They believed that these were some of the many blessings of Pathaji Pir. The Rabari community is divided into sub-groups, which are categorically based on geographical zones. The colloquial term for these sub-groups is ‘pargana’, which can be best defined as the equivalent of modern-day districts. Kachhis, Vagadias and Dhebarias are the three broad sub-groups of the Rabari community who reside in Kutch. The Kachhi sub-group in contemporary times lead sedentary lifestyle but still keep animals like cows, sheep, goat and camels in certain cases. They reside between Nakhatrana and Bhuj talukas. The Vagadia sub-group resides in the Vagad area near Bachau taluka. They migrate only within the Gujarat state. The Dhebaria sub-group resides between Anjar, Mundra and Bachau talukas. The word Dhebar colloquially means ‘Rotla’ (flat bread). The Dhebrias are known for their hospitable nature, and thus derive their name from Dhebar. Dhebarias prominently migrate with their maal (cattle) on a national scale to states such as Gujarat, Rajasthan, Maharashtra, Madhya Pradesh, Uttar Pradesh, Chhattisgarh, Andhra Pradesh and Odisha. Among all the Rabari sub-groups, the Dhebarias are credited with having achieved the most extensive scale migration. These sub-groups do not share any common ancestry or lineage with each other and evidently display distinct cultural variations. They are predominantly endogamous but marriage between sub-groups is permitted. The intricacy of relationships within the Rabari community is evident from its social organisation. Kinship can be classified in terms of sub-castes and lineages. There are 133 different sub-castes, which are known as atak or shaakh. The community also recognises this classification as vihotter. The atak or shaakh are exogamous patrilineal lineage groups found across the different sub-groups and across the whole Rabari community (i.e., members of the same clan are found in different regions of Rajasthan and Gujarat, Salpeteur et al. 2015). A few examples of atak are Karotra, Bhaar and Khambaliya. These atak or sub-castes are further branched out with lineages, which may subsist for several generations. The Rabari community refers to these lineages as vaas or fadiyu, which is usually named after the founder of the lineage, for example, Pethani meaning ‘of Petha’, Dhanani meaning ‘of Dhana’. The vaas or fadiyu can experience segmentation in that an individual may create his own lineage, which may exist alongside the original (Salpeteur et al. 2015). Each vaas has its distinct kuldevi or kuldevata (clan deities). All social events, especially marriages within a particular vaas, are communal affairs. The terms vaas and fadiyu are also independently used to signify neighbourhoods within the village. For instance, a particular neighbourhood wherein most residents belong to the Shujaani vaas or fadiyu reside may come to be identified by its name. Marriage within the same atak or shaakh is strictly prohibited since members are seen as related in having a common ancestry. The traditional occupation of the Rabari community is animal husbandry. The community primarily maintains flocks of sheep and goat in present times, but their history states that they were originally camel herders. The Rabaris undertake large-scale migration to various parts of Gujarat and other states of India to graze their animals. The Rabaris who lead sedentary lifestyle or those who have sold their maal and returned to their native villages prefer to maintain cows and buffaloes, work on the fields, drive rickshaws, keep shop, etc., instead of working in companies or related sectors. The community prefers to remain self-employed instead of engaging in auxiliary occupations. In the Kutch district, the Rabaris follow three distinct patterns of migration, which are season-based movements: small-range migration within Kutch; long-range migration between Kutch and Gujarat hinterlands, and circular migration within a delimited area, outside Gujarat (Salpeteur et al. 2015). The Rabari often ascribe their migration out of Kutch to the area being a drought-prone region, which effects the availability of the grass, fodder and water essential for their animals. The Rabaris mostly migrate in groups, composed of individual families. The nuclear family within a dang is called vandhyu, and is often part an extended family. A dang may have between five and twenty-five families traveling together. Each vandhyu may consist of husband, wife, children, even grandparents along with a flock of approximately 300–400 sheep and goats, a camel to carry all their supplies, which range from various utensils, cooking rations to clothes, etc. The supplies carried by the vandhyus are called ghar vakhari. The head of the dang is called patel. The patel is unanimously elected, and needs to possess a particular set of skills. The first and foremost quality that the members of the dang seek in their patel is trustworthiness. The patel needs to be very articulate, and must maintain contacts with various villages and other dangs along their route of migration. He needs to negotiate and deal with the panchayat, sarpanch of the village or individual farm owners to seek permission to graze in areas in or around their lands. The most important skill expected from a patel is his ability to scout for and identify the best and most suitable areas to camp and graze for his Dang. The basic requirement of any particular camping site is availability of water, grass-fodder for the animals and its proximity to a village where requirements ranging from rations to medical needs can be met. The patel may retain his status as long as his dang trusts him. There is no fixed tenure or regulations for electing the patel. If the dang begins to lose trust in their patel, the elders gather and identify worthy individuals, one of whom is then elected as the next patel of their dang. The dang migrates to a new location almost every day. The men engage in grazing their animals during the day and the patel either goes scouting for a new location or to obtain consents from the heads of the nearest village to his dang setting up camp. The women are responsible for setting up the camp and shifting it to the next selected location as directed by their patel. In earlier times, the patel would return to communicate their next destination, but at present mobile phones are predominantly used as the medium of communication. The vernacular term for setting up camp is known as utara, which means ‘to bring down’. An utara is set up by assembling all the ghar vakhari, to be carried upon the camel. The Rabari women are responsible for camping and decamping up the utara. The roles for women and men in each dang are distinctly defined. The diligent Rabari women look after the cooking, cleaning, washing, tending to the children, grazing camels and tending to the young lambs of the maal, churning buttermilk, making ghee, curd and butter. In the afternoons, the Rabari women gather at a common place and embroider bharat (prior to the imposition of ban on bharat). The sole responsibility of the Rabari men is to graze their maal and look after the business end of their profession, which is selling the maal, milk and wool among other produce. Any particular Rabari maaldhari (cattle herder) may sell a part of his maal a minimum of two times. The price for a particular sheep or goat depends on two factors, its age and health, usually fetching around ₹3000 to ₹5000 per animal. The Rabari shepherds, who maintain flocks of sheep and goat, do not sell the milk on a large scale. It is predominantly used for their own family's usage. The sale of wool from sheep and goat has diminished exponentially for the maaldharis from Kutch. City traders would send people to cut wool for which the Rabari would be paid; but in present times wool does not fetch any price. In such a condition, the Rabari themselves cut the wool and either use it to make rope to tether the lambs or choose to discard it. The migrating Rabari Dangs place immense importance in the welfare of their camel among all of their livestock. They consider the camel as the backbone of their lives and their profession, especially during migration. There is utter breakdown in the lives of a migrating family if their camel dies. The loss of their camel would be temporarily solved by availing of assistance from their dang members. In the longer run, generating funds and access to preferred camel breeders takes precedence. In such cases, selling a part of their maal or seeking loans from local moneylenders at high interest rates are their preferred options. Apart from these major concerns, several minor issues increase the burden on a Rabari family when they lose their camel. For instance, if a family loses its camel while migrating in Maharashtra, the first step for them is to generate funds to buy a new camel, which means either selling a part of their maal or seeking a loan. The second question is to find hired help while the male member of the family travels to purchase the camel. The hired help costs around ₹100 to ₹500 per day along with food, clothes and, in some cases, shelter. The third concern is to travel to their preferred camel breeders in order to purchase the new camel. The fourth is to give undivided attention to the care of the camel on their return journey. This is very crucial since the camels do not adjust to new environments very quickly. If due to any reason during this return journey the camel dies, the entire effort is a failure and becomes an added burden on the family. The demise of a camel is a common cause of many Rabaris falling into debt. The Rabari men wear kediya or kediyu (upper garment), a dhoti along with a pagadi (turban), which are always white in colour, and cotton is the preferred material. During important occasions, especially weddings, the men wear a scarf-like garment called khes, which is woven from wool, and traditionally would be intricately embroidered. The Rabari women wear kapdu (blouse), ghaghro (skirt) and chundari (scarf) to cover their heads. Before the ban, the kapdu would usually have some form of embroidery but in recent times readymade embroidery patches are common. The Rabaris consider themselves descendants of the Rajput clans. They are devout and fervently religious people, and follow the Hindu religion. The most revered deity, or in the colloquial language their gurudwara, is Vadvala (Vadvara) Dev, which is the trinity of Ram, Lakshman and Janaki (Sita). The primary gods worshipped by the Rabari community are Shiva, Krishna and Ram, thus making Maha Shivratri, Janmashtami and Ram Navmi their primary festivals. Apart from these festivals, Diwali, Holi, Navrati and Dussehra are always widely celebrated. The Rabaris also worship kuldevis and kuldevatas, or their clan deities. Shesh Mata, Momai Mata, Khodiyaar Mata, Vihat Mata, Chamunda Mata are a few of the many kuldevis of the Rabari community, which vary based on the fadiyu (lineage). The Rabari also worship several community heroes such as Pabu Dada, Goga Dada, Vachra Dada, Vanua Devji and Khetarpaal Dada. These heroes are often individuals who have sacrificed their lives to protect animals, or who have performed acts of great valour for the well-being the community. The festival celebrated in commemoration of these community heroes is called ‘Bharyu’. In most Rabari villages, commemorative hero stones, called samadhi, are installed on the outskirts of the villages. A samadhi is installed to commemorate community heroes both past and present. The Rabari community also worships several pirs (Sufi saints), such as Vada Pir and Pathaji Pir. A dargah of Pathaji Pir is situated in Mindiyala village. The first Monday of Bhadarva month of the Indian calendar is celebrated as the festival of Pathaji Pir, when a procession is taken from the centre of the village to the dargah in grand celebration. The procession is called neju, which consists of dhawajas (flags) in various colours. A grand fair is organised in Mindiyala village on this day, which ends with a village feast. The Dhebarias are governed by a panchayat with its headquarters at the local samajwadi (community centre) located in Anjar town. The samajwadi is the preferred location to organise important community events and for gatherings to discuss significant social issues, which are often convened by the Rabari Samaj Panchayat. The Dhebar Rabari community has established its very own residential school in Anjar town by generating funds from within the community. Owing to community support, this school is able to function independently. It has boarding facilities for both boys and girls, and children are given formal education along with education in their own culture and tradition, which the community believes they will never receive in private or government schools. The Rabari bharat embroidery is produced using three distinct patterns, which are katab (appliqué technique), moti (beadwork) and abhla (mirror-work). The motifs that most commonly feature in the Rabari bharat are geometrical shapes such as squares, rectangles, triangles and circles. Bharat embroidery also features motifs related to landscapes, flora, fauna and deities. The most alluring aspect of bharat embroidery is the intricacy of its stitching patterns, of which the chain-stitch is the most common. The pioneers of bharat embroidery are the women of the community. The traditional knowledge of sewing the Rabari bharat is passed on from mother to daughter. Whether in the village or while migrating in a dang, the women gather in a common place to embroider after finishing their daily chores. The Rabari women express their aesthetic sense through the portrayal of their myths, beliefs, culture and life experiences in their stitching. Clothes, animal garments, artifacts of home décor most commonly feature bharat. Over the course of time, bharat became a medium of dowry in the Rabari community. According to Rabari custom, the family of the groom pays a bridal price to the girl's family, and in return the bride brings pieces of bharat embroidery as dowry. Mothers would start training their daughters as soon as they reach maturity. As the custom developed, it came to be a cause for concern for the community. One condition was that the bride could not enter the home of her in-laws until she had completed the pieces of bharat demanded. Embroidering bharat is an intense, time-consuming activity, and, given also their migrant lifestyle, Rabari girls would find it very difficult to complete the embroidery before their marriage. This meant they could not join their husbands until they were between 30 and 40 years old. This had a huge impact on their matrimonial lives and eventually bharat as a form of dowry became socially taboo. This issue largely affected the Dhebarias. The Dhebar Rabari Panchayat led the initiative to tackle this rising issue by undertaking a survey and making public pronouncements in several villages. A community gathering was summoned at the Rabari Samajwadi in Anjar town. The community leaders described the growing threat the bharat dowry system represented to the community as a whole. They discussed various solutions, but the only viable one was to impose a ban on making and wearing bharat. So in April 1995, the Dhebaria Rabari council issued an edict to impose a permanent ban on the making and wearing of bharat by any member of their community. Any contravention would result in the imposition of a fine and the individual who defied this decision would be a criminal before the community and its gods. In recent times, community members feel there are both pros and cons to the ban. With the Rabari brides free of their social obligation of bharat dowry, they could now join their husbands at the appropriate age. But in hindsight, the beauty of their artistic expression has been forfeited. This is essentially true since the traditional method of sewing bharat embroidery is threatened with extinction, which is being addressed by NGO’s such as Kala Raksha and Shrujan through their conservational initiatives. Rabari Pabiben is the first community woman who through her endeavor www.pabiben.com has brought together several Rabari women artisans with the aim of reviving the art and empowering the women of her community. The impact of an alien plant species such as Gando Bawar (Prosopis Juliflora) can best be described as an aggressive encroachment. The plant, native to Mexico, South America and the Caribbean, was introduced in India as a measure to check the growing desertification of Kutch. The elder members of the community share that during the prime ministership of Indira Gandhi, the seeds of Gando Bawar were chosen, bought and broadcast in Kutch through helicopters. The impact of Gando Bawar has been immense on the native vegetation, especially on trees such as Kher, Kendoori, Gargeti, Gundi, Luski, Khijdi, Bordi, Kerdo, Vedho, Vikro, which the community claims are on the verge of extinction. The Rabaris explain this phenomenon thus, ‘The tree is very poisonous in nature, nothing can grow under the shadow of this tree.’ The roots of the Prosopis Juliflora have a tendency to grow very deep and to extend widely in search of water, resulting in depletion of the sources that would have nourished other trees. There are not many constructive uses of the Gando Bawar, apart from its use as a source of firewood, or making makeshift sheep pens or boundaries (fencing). 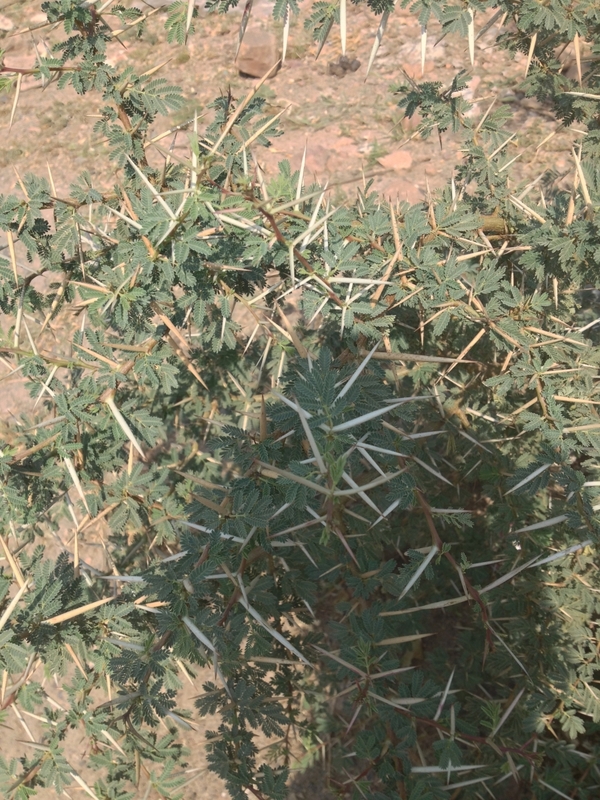 For the maaldharis, the plant has caused several problems since the thorns of the tree often cripple the animals, as their removal is very difficult and if not attended to might cause septicaemia and eventually lead to amputation. The leaves, fruits or any produce of the tree are not useful for the animal-keeping profession since high consumption causes diarrhea. Another rising issue is the indigestibility of the seed—even when excreted by the animals, it causes a new plant to grow. This has caused a rising fear among farmers leading to a large-scale decline in their inviting the maaldharis into their farms for natural fertilisation, for which the maaldharis were also paid in money or foodgrains. The Gando Bawar also is a big hindrance to mobility for the maaldhari. In Rato Talao, a few Rajasthani Raika cow keepers have also been heard saying that they have witnessed this tree growing even inside the stomachs of their cows. Edwards E. 2003 ‘Marriage and Dowry Customs of the Rabari of Kutch: Evolving Traditions.’ Berg. Indext-C. 'Industrial Extension Cottage' (website). Online at http://craftofgujarat.gujarat.gov.in (viewed on January 19, 2018). Ministry of Social Justice and Empowerment. 2017. 'List of Scheduled Castes'. Online at http://socialjustice.nic.in/UserView/index?mid=76750 (viewed on January 19, 2018). National Commission for Backward Classes. n.d. 'Central List of OBCs for the State of Gujarat.' Online at http://ncbc.nic.in/Writereaddata/cl/gujarat.pdf (viewed on January 19, 2018). Times of India. 2004. '"Gando baval" overtakes "neem" as state's no. 1 tree', The Times of India, Ahmedabad, December 4. Online at http://timesofindia.indiatimes.com/city/ahmedabad/Gando-baval-overtakes-neem-as-states-no-1-tree/articleshow/946590.cms (viewed on January 19, 2018). Wikipedia. 'Prosopis Juliflora'. Online at https://en.wikipedia.org/wiki/Prosopis_juliflora (viewed on January 19, 2018).